Some people are looking for recognition. Others look for fame. Some others look for money only. Basically, they all have one thing in common. A lack of real priority. When it comes to having fun, being fast and get positively furious most people go astray. Within the Salt Slush team, we suffer from the above too! But we're trying, and we're trying hard to be true to our souls. We're trying hard to break free from the surface and instead nourish our gearhead minds and climb the ladder of our inner dreams. So what's the next step on the eternal journey? Here's what; Besides of a zillion private projects per person, all in need of non existing completion dates, we're still looking for a silent, still stressful, moment. A moment to get peace of mind in on the dusty, salty but still clear deserts surface. We've found what we've been looking for. A great wide open, someone that's pointing in the right direction and real speed! With all of the above in place, we'll be climbing the inner ladder of our souls...soon. I've never really understood the point of showing the privat residence to friends and guests. Don't get me wrong, it nice to have friends coming by, to have a party or a dinner at home, but house walk-arounds where thing like; -This is our bedroom…and here's our bathroom….never really struck a cord with me. If it's full of cars, engines and bikes and not the least parts, you can walk around and just take in all details. You can stay for hours and hear stories about a car project, or get an epic tale which end up with the purchase of a gas tank, a special crankshaft etc. It's like a flea market and a story telling session combined. On top of the above, you get to know personalities when visiting a workshop, a kind of gearhead analysis. Garage archetypes. The collector, the builder, the fabricator, the machinist, the polisher, the wild grinder, the pedant, the dreamer, the project guy, the artist...and sometimes all in one place in...in harmony…well, at least not in war. Some clean every spot, buy a new work bench and paint the walls white before they take an engine apart. Other just push a way what's in the way and tear the engine to pieces without even cleaning it first. Some just buy tools, others use theirs every minute. But it really doesn't matter, it's the gasoline (or diesel) sprit that counts. Garage visit are always nice, but when friends becomes garage neighbors it's even better. Annika and Ragnar just moved in close to Salt Slush workshop. Their profile? This couple is a mixture of pedant, fabricator, artist, wild grinder and project man/woman. A good and complex combo. Salt Slush welcomes Annika and Ragnar and wait for the party! A picture is worth a thousands words and there are a lot of pictures in our new movie. 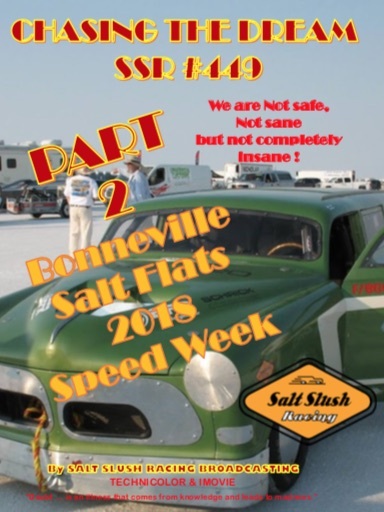 It's about our adventure at Bonneville Speed Week 2018 at the Salt Flats. Check it out ! on You tube !